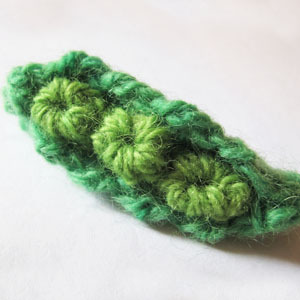 Use a yarn needle to whip stitch the two pod pieces together, leaving an opening for the peas. Place each pea inside the pod and use a needle and thread to secure them in place. This entry was posted on Tuesday, June 19th, 2012 at 12:00 AM by Emilee Gettle	and is filed under Free Crochet Patterns. You can follow any responses to this entry through the RSS 2.0 feed. You can skip to the end and leave a response. Pinging is currently not allowed. This is the cutest thing I´ve seen in a long while! Excellent! 🙂 And thank you! I agree with Cami…the cutest!